Berkeley and Oakland have occasionally had a fraught relationship. Berkeley has the long-term support of UC Berkeley, while Oakland sits at the geographic center of the Bay area and was long known as a national capital of crime. Divergent stories. But in mid-2015 do the stories of Here and There continue to diverge? 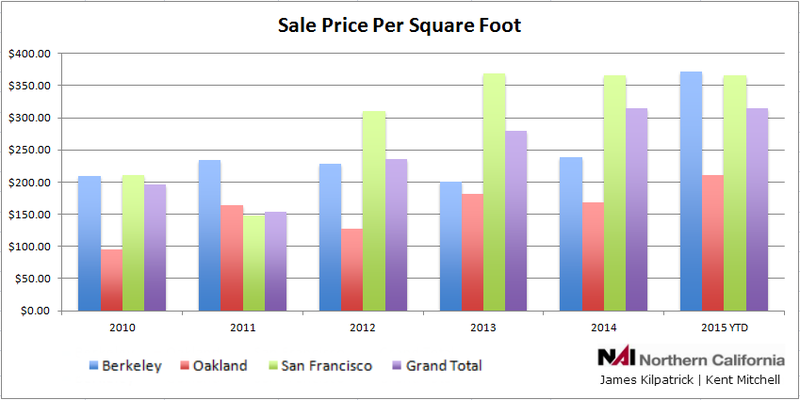 We’ve seen pricing on assets in Berkeley increase while inventory diminishes. In Mid-July our team made a competitive presentation on a Multifamily building near Ashby and Telegraph at $350,000 per unit and almost $500 per square foot. This was not next to UC campus but way out in an area that is usually considered more marginal. That’s Berkeley and we’ve seen this sort of market before. But what is the bigger regional picture and how does that relate to the Berkeley market? Enter Oakland. Berkeley’s neighbor to the south seems to be benefiting from this current economy in a big way also. From Rockridge to Temescal, Jack London Square to Adams Point on Lake Merritt we see Multifamily pricing pushing upwards towards…$500 per square foot. Wait, didn’t we just say that was high for Berkeley? How could…Oakland… The point seems to be that this economy is hitting Berkeley’s neighbor harder than past booms. Why exactly is that? San Francisco is suddenly on the map. Did you know that it wasn’t before? According to members of the panel at the July 14, 2015 RealShare Convention in San Francisco, when real estate investment groups not based in San Francisco talk about a top handful of U.S. markets they mention LA and NYC and they also mention San Francisco. It’s on the global map and this is affecting real estate values regionally, as there is a global demand for San Francisco real estate. Berkeley and Oakland (and the entire Bay area) are caught up in something bigger than themselves. And one has to wonder what comes next. Conventional wisdom holds that we’re 6-7 years into an economic recovery and likely have 3-4 years before a pullback. I remember the recession of 2001: my rental units in Berkeley and Oakland had shorter lines of tenants, they didn’t beat me to the property for showings, I had to show each unit several times to get the rent I wanted, and I still got an increase in rent every time I turned over a unit and spruced it up. Basically, no big change. I remember the “economic meltdown” of 2007-8. Just read the lines above again because that was my experience then, too. What is the “pullback of 2018” going to look like for rental owners? Rather than glibly state that it will be the same as those past two recessions, let’s look at two factors that might be different: maximum rent per square foot and renter income. In the example above, a multifamily building near Ashby in Berkeley, the owner’s most recent rental per square foot per month is over $4. That’s off the charts high. Is it sustainable? Maybe. Because people in urban environments are favoring smaller, well-located, highly functional spaces to live. That’s trend number one. Renter income is the other trend to watch. We have not only a whole country but a whole world of people who want to live in a city that’s on the world map. They want to be Here. Even during a downturn it is likely that San Francisco, Berkeley, and Oakland will all still be Here and those who live There will still want to come check us out. According to citylab.news average recent commute times for residents of Berkeley, Oakland, and San Francisco residents were 25, 27 and 29 minutes, respectively. This not entirely surprising statistic may tell us something important about living near Downtown San Francisco: it’s possible that you’re closer in Downtown Berkeley or Oakland. After all, who has a better view of San Francisco, the City itself or its next door neighbor?